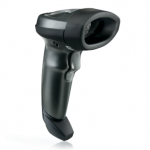 The LI2208 represents the next generation in 1-D scanning and builds on our most popular scanner ever, the LS2208. 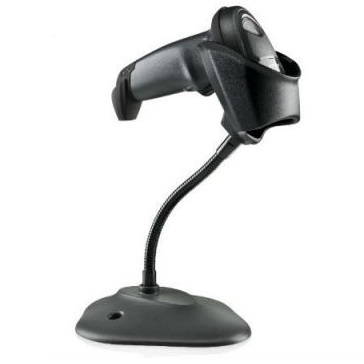 You get the same reliability and ergonomics of the LS2208, combined with enhanced features such as extended range and support for mobile bar codes. With our best-in-class linear imager, you can count on unparalleled scanning performance on every bar code, every time. • Get the next evolution in 1-D bar code scanning and improve productivity in your operations with the LI2208. Virtually any 1-D bar code can be captured — including the typical bar codes that are printed on paper labels; electronic bar codes displayed on the screen of a mobile phone, tablet or computer that allows retailers to easily process loyalty cards, mobile coupons and more; and the high density (HD) bar codes commonly used in specialty retail and electronic component manufacturing. A patented optical design achieves an industry leading working range: 13 mil 100% UPC bar codes can be captured from near contact to over 30 in./76.2 cm away, while 26 mil 200% UPC codes can be scanned at 55 in./139.7 cm away. Since bar codes can be captured at extreme angles, scanning is easier than ever, so workers spend less time maneuvering the scanner and more time on task. And an optional stand enables automatic switching between handheld and hands-free modes. • The LI2208 performance and design features combine to allow your workers to better meet the needs of your business — and your customers. Workers can scan more types of bar codes on more types of surfaces, increasing productivity at the retail Point of Sale (POS), in the warehouse, on the production line in a light industrial manufacturing plant, at event registration, hotel check-in and more. • A patented single circuit board improves reliability by eliminating connectors and ribbon cables, which are the most common points of failure. You can drop it and use it in dusty and damp environments — and still expect reliable operation. • New smart auto-host detect cables automatically distinguish which interface is attached, reducing the need to scan multiple parameter bar codes. Over 90 international keyboards are hosted within the scanner making localized set up fast and easy. • Our industry leading all-inclusive affordable service plans help keep your LI2208 bar code scanners in the hands of your workforce, practically every minute of every day. Built-in Comprehensive Coverage protects your scanners from the unexpected, significantly reducing unforeseen repair expenses and delivering service peace of mind from the moment you purchase the device. And Service from the Start Advance Exchange Support adds next-business- day advance replacement of devices that require repair. • EMI/RFI: FCC Part 15 Class B, ICES-003 Class B, European Union EMC Directive, Australian SMA, Taiwan EMC, Japan VCCI/MITI/Dentori. • The Symbol LS2208 is warranted against defects in workmanship and materials for a period of 5 years (60 months) from date of shipment, provided that the product remains unmodified and is operated under normal and proper conditions.